Rapper Rick Ross and his girlfriend Shateria (above) have had one heck of a morning. As fellow rappers and hip hop heads took to twitter to wish him a happy birthday he was dodging bullets and crashing his Rolls Royce. Yes. Just this morning after leaving a restaurant celebration for a new year, Rick Ross and his girlfriend were blasted with bullets. Witnesses claim a vehicle pulled up beside them and someone in the car opened fire. 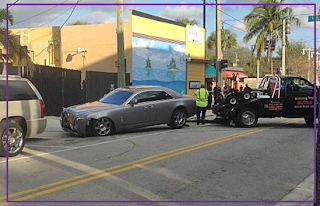 The two managed to drive away, but it wasn't long before Rick's Royce crashed into a near by building. Cops say that the shooters got away but not before spraying bullets into a couple of nearby establishments. Thankfully no one was hurt, and only Rick's fancy car suffered physical damage. The gun violence these days is just frightening. I'm sure this isn't the way Ross hoped to bring in a new year, but at least he made it through it. Photo of his car below.